​I have known Gloriji for many years via Facebook and we have made contact on a numerous occasions either though messages or personally through Skype conversations. In my experience, there are a limited number of people with whom I can talk in great depth about the reverberations of awakening on daily living. Gloriji is one such connection - I have always found her contributions to discussion to be profound deeply insightful wisdom. She is a very loving person too and I am very grateful to call her my friend. With her very rich and interesting background - having lived life on the edge in many ways, I feel she has experiences that really understand directly the nature of the human condition and suffering. This makes her a really unique mentor and guide in the aftermath of an awakening for those that are called to connect with her. ​"I was at a retreat sitting in the back of the room and I heard a woman (Gloriji) speak to the presenter from the front row. I could not even see her but I knew beyond a shadow of a doubt from her voice that she was living in non dual awareness and was a true teacher. I tracked Gloriji down after that workshop and stuck to her like glue. Her very presence brought me profound clarity, reassurance & took me even deeper into 'my' own awakening experience. I feel so blessed to have access to this beautiful, loving woman. Gloriji is helping me navigate this unfamiliar terrain and I am deeply humbled and grateful." ​First of all, Gloriji and I are siblings from different mothers. Being born a month apart has bonded us in our generational affinity. From the moment I met her, Gloriji has embodied a deep-rooted serenity that projects an aura of peace and unconditional love. She's one of the few people I've ever known that has had that effect on me. She creates a vortex of peace and all are fortunate that gravitate toward the center of that energy. She was always a shaman even before she ever uttered the term in my presence. That magnetism she projects is truly powerful and I've seen her respond with equanimity even when challenged by a contrary point of view. She sees to the divine core of each of us with a spiritual x-ray vision. I am honored to call her my spiritual sister and I feel blessed to love and be loved by her. From the very meeting (on Facebook) Gloriji has been an oasis of love, tenderness and insightful Support. If ever there was a Mirror of authenticity and integrity... she is it. Adya has stated "it's more important to be in integrity than to be enlightened." This statement speaks so profoundly of what Gloriji is and what she reflects. Integrity is naturally (a) whole... (a) Oneness... where All is naturally included... Most importantly our divine Humanity This embrace of our Divine nature and out Humanity... never separated... is the emergent feminine Wisdom of which Gloriji is at the forefront. I count her as one of my profound Blessings. I’ve known Gloriji for over 8 years, and over the course of that time she has become the local community’s spiritual guide. For the past 5 years I’ve benefited from Gloriji’s devotion to her own path of spiritual and open-hearted awareness. Many in our spiritual community have participated in Gloriji’s classes, group meditations and spiritual inquiry lessons. 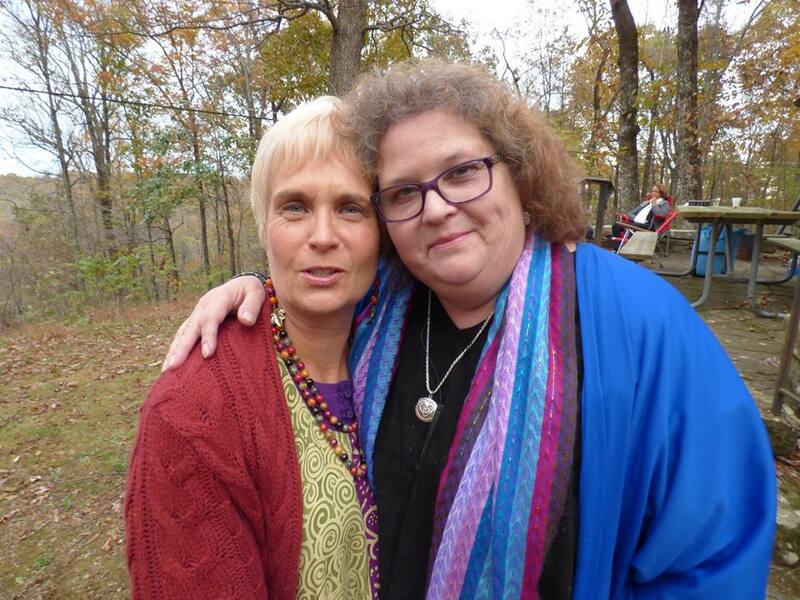 Throughout these past five years I have benefited from Gloriji’s extraordinary patience, compassion, and most especially her personal commitment to discovering her own authentic open-hearted spiritual presence. Gloriji has grown into a person that is aware, yet spontaneous in her ability to guide me along a path of discovery to my own true awakening. She encourages me without fawning, and offers guidance without judgement. Gloriji has chosen the Shamanic path to further her own awakening of Spirit. I am blessed and deeply moved to know and share my own spiritual path with Gloriji. ​I have always loved Gloriji’s voice. She speaks from a wisdom of experience, and has gone through her own fire of her body. Gloriji’s expression has such a penetrating presence. Her words resound a depth of intrinsic knowing and discovery, whilst her pointing never forgets the kindness and tenderness that is her nature. In my heart I feel that it is something very special. What a joy this is. I have known Gloriji for a few years. When I first met her, I felt a special connection with her. I could feel that she had a kind and gentle heart and soul with great intuition. She goes out of her way to be there for others. As I was on my journey of awareness, I realized that I was confused and needed guidance, so I asked her for help. Gloriji and her guidance helped to lead me into myself, where I could begin to see who I really am and the peace that is always there. I just had to remember to step back and look inside, so I am able to see, feel and allow the truth of who I really am and the peace that is always there to emerge. Gloriji has worked with me in other ways as well. Even though I get stuck, fearful and sometimes lose my way, she is there to show me the way back to myself. It's all about self discovery. Gloriji's abilities reach far beyond what I have mentioned here. It would take pages to explain all the ways she has helped me. I can honestly say that Gloriji and her work is very valuable to me. I am very blessed and grateful to have her as part of my life and my journey! Copyright ​© 2017 Gloriji. All Rights Reserved.